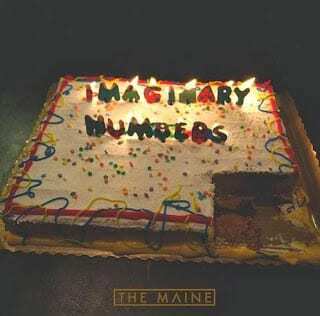 Just last month, Arizona bound rock band The Maine released their first ever fully acoustic EP named Imaginary Numbers. Despite having just completed a world tour following the release of their fourth studio album, Forever Halloween in June, they’ve both recorded and produced this EP on their own, using a studio they built themselves. It’s safe to say that for their first acoustic EP, this record has been heavily anticipated, especially after Forever Halloween bought us a distinctive more grounded and sophisticated sound from the five piece band. Imaginary Numbers gives us five songs – some of which derived from poems front man John O’Callaghan had previously written – that simply didn’t belong on their previous album or fit in with it’s sound. The result is a raw, laid back and truthful album that gives us a real look inside of the band’s minds. It was only with the release of These Four Words from Forever Halloween that John O’Callaghan admitted it was the most revealing song he has ever written, which is far cry from some of their other more pop punk singles such as Inside of You and Everything I Ask For. This EP has only delved further into his mind and created an honest and upfront image of the world – and love – from his point of view. It’s clear to see that as this band have grown up, so has their music. This EP strips away all the preconceptions of what an album should have – if you’re expecting a mix of upbeat and inspiring songs, then this isn’t the EP for you. Instead it’s brutally honest and the fact that most of the songs were taken from what began as poems somewhat suggests that this EP wasn’t put out with the aim to earn money and gain record sales. It’s simply a gift to the fans; a full on and basic bunch of songs put together, something the band have perhaps enjoyed putting together in their own time and have just decided to share, as opposed to producing an album as a career move. Raining in Paris is the first song on the album and lays the perfect foundation for the rest of the EP; it’s easy on the ears, the lyrics are thought provoking and just listening to it immediately relaxes you with it’s slow instrumentals and John’s soothing and beautiful vocals. A slight ode to Kennedy Curse from their last album I feel, this song has a slight country feel to it, which I think accurately represents some of the bands biggest influences. Room With No Windows reminds me a lot of a song called Happy from their previous album, in that it’s a more upbeat tune and beat only to reveal much more when you listen to the lyrics. It’s not a happy song but it’s very easy to catch onto and sing along to. It has a very relaxed and acoustic vibe to it, with undertones suggesting that sitting around and sulking isn’t going to change your life if you’re not actually willing to get up and do anything about wanting that change. Perfectly Out Of Key really stands out for me and is very powerful. Backed up by only beautiful piano keys, John sings about never necessarily fitting in; how everyone might feel a little different and weird sometimes but that despite the pressure of being expected to maybe be one person, you should be happy with who you are. He’s singing about how he’d much rather be different and view the world through his own eyes, with his own mind because even if it’s not necessarily right, it’s a lot easier than dealing with some of the bad stuff this world sometimes has to offer. Another firm favourite of mine, Visions is a hauntingly beautiful ballad which is clearly the second part to These Four Words from their previous album. It tells the story of how he’s suffered a break up and as hard as he tries to get over it, he’s constantly reminded of that relationship; their story and their memories. Visions haunt him, but as much as he wants to move on, in some ways he likes having that reminder and might be ready to let go, but he doesn’t necessarily want to. It’s bittersweet in many ways. It’s a classic song that simply won’t get old and I feel that I’ll be listening to this in years to come. The simple but beautiful Harmonica solo adds further character to the song, and all you have to do is close your eyes and listen to the lyrics to this song to find yourself in John O’Callaghan’s shoes, remembering and having visions of your own past relationships too. Lovely Sad again has a slight country feel to it and I love that it rounds up that similar feeling from what the first song brought to the EP, ending the release with such a natural progression that you could press repeat and listen to the whole thing all over again. Lovely Sad is also what provides the EP with it’s name and has some powerful lyrics, such as ‘what if’s and the should have’s, they start to eat my brain’ – another nod to one of the front man’s previous published poems. This is another sad song, but this time it isn’t disguised with a more happy tune. It’s not a sad tune per se, but it’s a beautiful song that successfully sums up the EP. It ends with the lyrics ‘we’re all sad, but to me we’re lovely sad’ which I suppose is a bittersweet feeling and a continuation on from the fact that we may be sad, but that’s okay, if somewhat lovely too. The Maine have yet again impressed with their newest EP which is a small and honest stepping stone between albums. I hope they keep their upfront honesty displayed in this EP and their last album for whatever they plan to release next.